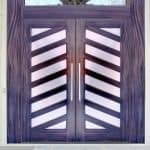 This Custom Contemporary Front Entry Door was designed and built by Doors By Decora. These 36″ X 80″ 14 Lite Contemporary Doors was built for a home in Santa Claira, California. The Glass is Clear Tempered Insulated Glass. The Hardware is FSB 1176 Lever on 1410 Back Plate 32D.